Lyme disease was first recognized in 1975 as a distinct clinical disorder (Steere et al. 1977) and is currently the most frequently reported vector-borne disease in the United States (CDC 1995). Transmission of the spirochete Borrelia burgdorferi, the causative agent of Lyme disease (Burgdorfer et al. 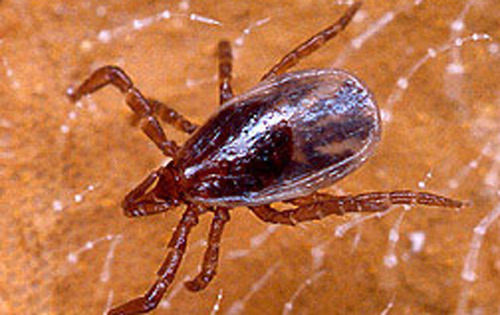 1982), occurs by the bite of Ixodes ticks. In the United States, the blacklegged tick, Ixodes scapularis Say affects the greatest number of people for three principal reasons: their geographic distribution coincides in the northeastern United States with the greatest concentration of humans (Miller et al. 1990); spirochete infection rates are high, often exceeding 25% (Burgdorfer et al. 1982, Anderson et al. 1983, Magnarelli et al. 1986); and the geographical range of the tick is spreading (Lastavica et al. 1989, Anderson et al. 1990, Godsey et al. 1987, Davis et al. 1984). Figure 1. Female blacklegged tick, Ixodes scapularis Say, questing on a stick. Photograph by Michael Patnaude, University of Florida. In 1993 Ixodes dammini was shown the same species as Ixodes scapularis and as a result has retained the older name (Oliver et al. 1993). Those who read papers with references to Ixodes dammini should make note of this change. Ixodes scapularis is found along the east coast of the United States. Florida westward into central Texas forms the lower boundary, although there are reports from Mexico. The upper boundary is located in Maine westward to Minnesota and Iowa. The distribution of Ixodes scapularis is linked to the distribution and abundance of its primary reproductive host, white-tailed deer (Odocoileus virginianus) (Wilson et al. 1985, 1988). Only deer or some other large mammal appears capable of supporting high populations of ticks (Duffy et al. 1994). In the northeastern United States, much of the landscape has been altered. Forests were cleared for farming, but were abandoned in the late 1800s and 1900s causing succession of the fields to second-growth forests. These second-growth forests created "edge" habitats which provided appropriate habitat for deer resulting in increased populations (Severinghaus and Brown 1956) and thus, may have increased populations of the blacklegged tick. Adult deer ticks have no white markings on the dorsal area nor do they have eyes or festoons. They are about 3 mm and dark brown to black in color. Adults exhibit sexual dimorphism. Females typically are an orange to red color behind the scutum. Figure 2. Male blacklegged tick, Ixodes scapularis Say. Photograph by Michael Patnaude, University of Florida. Figure 3. Two male and one female blacklegged tick, Ixodes scapularis Say, questing on vegetation. Only the legs are visible from the second male tick, which is on the opposite side of the vegetation. Photograph by Michael Patnaude, University of Florida. Ixodes scapularis is a three-host tick; each mobile stage feeds on a different host animal. In June and July, eggs deposited earlier in the spring hatch into tiny six-legged larvae. Peak larval activity occurs in August, when larvae attach and feed on a wide range of mammals and birds, primarily on white-footed mice (Peromyscus leucopus) (Anderson and Magnarelli 1980). After feeding for three to five days, engorged larvae drop from the host to the ground where they overwinter. In May, larvae molt into nymphs, which feed on a number of hosts for three to four days. In a similar manner, engorged nymphs detach and drop to the forest floor where they molt into the adult stage, which becomes active in October. Adult ticks remain active through the winter on days when the ground and ambient temperatures are above freezing. Adult female ticks feed for five to seven days while the male tick feeds only sparingly, if at all. Figure 4. Nymph-stage blacklegged tick, Ixodes scapularis Say. Photograph by Scott Bauer, USDA. Adult ticks feed on large mammals, primarily upon white-tailed deer (Odocoileus virginianus) (Piesman et al. 1979, Carey et al. 1980, Wilson et al. 1990). Beginning in May, engorged adult females typically lay between 1000 to 3000 eggs on the forest floor at the site where they detached from their hosts. Figure 5. Adult female blacklegged tick, Ixodes scapularis Say, engorged after a blood meal. Photograph by Scott Bauer, USDA. Figure 6. The life cycle and approximate sizes of the blacklegged tick, Ixodes scapularis Say, compared with the American dog tick, Dermacentor variabilis Say. Photograph by Michael Patnaude, University of Florida. Mortality rates for ticks are high. Tick death is caused by density-dependent factors such as parasites, pathogens, and predators, all of which appear to have little impact on tick populations (Roberts et al. 1983, Matthewson 1984, Mather et al. 1987a). Density-independent factors causing tick mortality include a range of adverse climatic and microclimate conditions, which can influence temperature and humidity and have the greatest impact on tick survival (Bertrand and Wilson 1996). Due to their low probability of finding a host, starvation is a major mortality factor of ticks. Host immunity and grooming activity may affect mortality (Randolph 1979, Brown 1988). The blacklegged tick, Ixodes scapularis, is an important vector of the Lyme disease spirochete, Borrelia burgdorferi, as well as the agents of human babesiosis, Babesia microti, and human granulocytic ehrlichiosis (HGE) (Des Vignes and Fish 1997). A significant feature in the transmission dynamics of Borrelia burgdorferi is the importance of the nymphal stage's activity preceding that of the larvae which allows for an efficient transmission cycle (Spielman et al. 1985, Wilson and Spielman 1985). Before and during larval tick feeding, the naturally infected nymphs transmit Borrelia burgdorferi to reservoir hosts. The newly hatched spirochete-free larvae (Piesman et al. 1986a) acquire the bacteria from the reservoir host and retain infection through the molting process. In the springtime, nymphs derived from infected larvae transmit infection to susceptible animals, which will serve as hosts for larvae later in the summer (Fish 1993). Human exposure to blacklegged ticks is greatest during the summer months when high nymphal Ixodes scapularis activity and human outdoor activity coincide. Their small size, their vastly greater abundance over the adult stages and the difficulty in recognizing their bites (Berger 1989) tends to make nymphs the most important stage to consider for reducing disease risk. Lyme disease occurs only sporadically in the southern states. Three hundred sixty-six cases were confirmed in Florida from 1999-2005 and most people with Lyme disease acquired their infection in the northeast. In the seven-year period 1999-2005, an annual average of 18 cases without a travel history outside the state were reported to the Florida State Health Office (Division of Environmental Health 2006). and by using artificial nest-box traps (Wilson 1994). Flagging for ticks involves using a cotton flannel or other fabric attached to a wooden pole. The cloth is either hung at one end in a flag configuration and dragged, or is attached to the middle and dragged by rope tied to each end of the wooden pole (Ginsberg and Ewing 1989a). The use of flags is the preferred method when collecting larval and nymphal Ixodes ticks as it samples host- seeking ticks in the leaf litter over a quantifiable distance or exposure. Traps baited with carbon dioxide are typically made out of a covered plastic tub mounted to a wooden base. Evenly spaced holes are made on the sides of the tub at the bottom, and dry ice is placed into the container daily during the trap's operation (Ginsberg and Ewing 1989a). As a surveillance tool, CO2 traps are generally unsuccessful for collecting Ixodes scapularis as these ticks exhibit limited horizontal movement (Falco and Fish 1991). To sample host-attached ticks, hosts typically are captured in live-capture traps after which animals are anesthetized and attached ticks are counted (Ginsberg and Ewing 1989b). A variation of this method involves holding the captured animals in wire mesh cages over pans of water until ticks detach (Mather and Mather 1990). Collecting ticks from the investigator while walking involves wearing cotton pants tucked into socks, and the collector removes attached ticks periodically while walking through the sampling area (Ginsberg and Ewing 1989a). This latter method is particularly effective for sampling adult ticks. Caged hosts can be used to attract questing ticks in a manner similar to CO2 trapping with the same effectiveness. Ticks can also be collected by aspirating excavated burrows and nests of hosts (Logan et al. 1993). This aspiration method is best used for collecting ticks associated with birds. Ticks can be retrieved from artificial nest-box traps when hosts inhabit the nest-box and ticks and other ectoparasites drop onto a sticky substrate which can be removed at a later time (Wilson 1994). Management of ticks usually involves several strategies including surveillance, personal protection and vector reduction. Surveillance is needed to identify areas for control and to prioritize management efforts. Ticks are surveyed by capturing mammals and birds and by sampling vegetation as described above. Pathogen infection rates of ticks or animals can be determined using various methods such as a direct fluorescent antibody procedure (Burgdorfer et al. 1982, Piesman et al. 1986b) and an indirect fluorescent antibody technique (Burgess et al. 1986, Godsey et al. 1987). Pathogen distribution can be evaluated using serological surveys (Daniels et al. 1993). Disease incidence can be tracked by monitoring cases from hospitals and other health agencies (White 1993). In any event the public is always informed through the media with the most recent information so that they can implement personal protection methods. These methods include avoidance of tick habitat and taking precautions when entering high risk areas. Socks pulled over the cuffs of pants, wearing light-colored clothing, walking in the center of trails, frequently checking clothes, application of repellents and examination of body at the end of the day are the precautions that should be taken when you visit a tick habitat (Stafford 1989). There are three basic methods for vector management: reduce immigration, increase mortality, and reduce reproduction. Restricting the movement of infested hosts into an area reduces the immigration of ticks since they cannot move far on their own. Birds are difficult to restrict but by reducing food supplies and preferred vegetation their migration through an area can be decreased. The density and movement of rodents, which do not travel large distances, may be influenced by altering habitat to reduce brush, stacked wood and food sources. Large mammals such as deer can be discouraged by landscaping with plants that do not attract them, fencing (Olkowski et al. 1990) and deer repellents (Daniels et al. 1989, Wilson et al. 1990). Increasing the mortality of the tick is an effective strategy. Targeting areas of high tick densities with pesticides is effective if it can reach the ticks (Schulze et al. 1987, Stafford 1991). Unfortunately, leaf litter provides a barrier to application. Pheromones combined with acaricides seem to have potential by targeting the tick with little effect to other arthropods, but this method has not been tested on Ixodes scapularis (Wilson and Deblinger 1993). The destruction of vegetation by burning is another procedure that can reduce tick numbers (Wilson 1986), but this may not kill the greatest population of spirochete-infected ticks which are protected in the dens of rodents underground (Mather et al. 1993). Altering the habitat around a home lawn can have a positive effect (Wilson 1986). Mowing, raking leaves, trimming back shrubs, and/or using pesticide treated wood chips can reduce favorable habitat for ticks by exposing these areas to lower humidity or pesticides (Mather in press). Eliminating the hosts of ticks reduces tick populations as well. Deer populations may be easier to reduce than those of rodents or birds. Experiments where deer were eliminated resulted in a decrease in the populations of larvae and nymphs (Wilson et al. 1988). Efforts have been made to target the immature ticks on the host with success using nesting material laced with pesticides (Mather et al. 1987b, 1988) or boxes containing pesticides with a food lure (Sonenshine and Haines 1985). 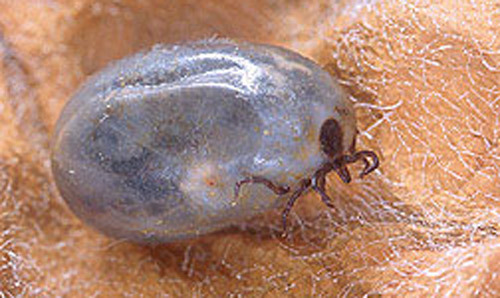 The feeding success of ticks can also be reduced by host immunity (Brown 1988). Tick repellents and acaricides used to repel or kill ticks as a control procedure pose difficulty because it requires handling large animal hosts (deer). Bait stations, where deer are lured to food to inoculate themselves with an acaricide or ingested treatment such as ivermectin show promise. Biological control using predators, parasites or pathogens have not been demonstrated under natural conditions to reduce populations significantly (Mather et al. 1987a, Wilson and Deblinger 1993). Anderson JF, Duray PH, Magnarelli LA. 1990. Borrelia burdorferi and Ixodes dammini prevalent in the greater Philidelphia area. Journal of Infectious Disease 161: 811-812. Anderson JF, Magnarelli LA. 1980. Vertebrate host relationships and distribution of ixodid ticks (Acari: Ixodidae) in Connecticut, USA. Journal of Medical Entomology 17: 314-323. Anderson JF, Magnarelli LA, Burgdorfer W, Barbour AG. 1983. Spirochetes in Ixodes dammini and mammals in Connecticut. American Journal of Tropical Medicine and Hygiene 32: 818-824. Berger B. 1989. Dermatologic manisfestations of Lyme disease. Review Infectious Disease 11: S1475-S1481. Bertrand MR, Wilson ML. 1996. Microclimate-dependent survival of unfed adult Ixodes scapularis (Acari: Ixodidae) in nature: life cycle and study design implications. Journal of Medical Entomology 33: 619-627. Brown B. 1988. Highlights of contemporary research on host immune responses to ticks. Veterinary Parasitology 28: 321-334. Burgdorfer W, Barbour AG, Hayes SF, Benach JL, Grunwaldt E, Davis JP. 1982. Lyme disease - a tick-borne spirochetosis? Science 216: 1317-1319. Burgess EC, Amundson TE, Davis JP, Kaslow RA, Edelman R. 1986. Experimental inoculation of Peromyscus spp. with Borrelia burgdorferi: Evidence of contact transmission. American Journal of Tropical Medicine and Hygiene 35: 355-359. Carey AB, Krinsky WL, Main AJ. 1980. Ixodes dammini (Acari: Ixodidae) and associated ixodid ticks in south-central Connecticut, USA. Journal of Medical Entomology 17: 89-99. Center for Disease Control. 1995. Lyme disease-United States, 1994. Morbidity Mortality Weekly Report 44: 459-462. Daniels TJ, Fish D, Falco RC. 1989. Seasonal activity and survival of adult Ixodes dammini (Acari: Ixodidae) in southern New York State. Journal of Medical Entomology 26. 610-614. Daniels TJ, Fish D, Levine JF, Greco MA, Eaton AT, Padgett PJ, LaPointe DA. 1993. Canine exposure to Borrelia burgdorferi and prevalence of Ixodes dammini (Acari: Ixodidae) on deer as a measure of Lyme disease risk in the northeastern United States. Journal of Medical Entomology 30: 171-178. Davis JP, Schell WL, Amundson TE, Godsey MS, Spielman A, Burgdorfer W, Babour AG, LaVenture M, Kaslow RA. 1984. Lyme disease in Wisconsin: Epidemiologic, clinical, serologic, entomologic findings. Yale Journal of Biology and Medicine 57: 685-696. Des Vignes F, Fish D. 1997. Transmission of the agent of human granulocytic ehrlichiosis by host-seeking Ixodes scapularis (Acari: Ixodidae) in southern New York State. Journal of Medical Entomology 34: 379-382. Division of Environmental Health. 2006. Surveillance and Control of Selected Arthropod-borne Diseases in Florida - 2006 Guidebook. Tallahasse, Florida. Duffy DC, Campbell SR, Clark D, DiMotta C, Gurney S. 1994. Ixodes scapularis (Acari: Ixodidae) deer tick mesoscale populations in natural areas: Effects of deer, area and location. Journal of Medical Entomology 31: 152-158. Falco RC, Fish D. 1991. Horizontal movement of adult Ixodes dammini (Acari: Ixodidae) attracted to CO2-baited traps. Journal of Medical Entomology 28: 726-729. Fish D. 1993. Population ecology of Ixodes dammini, pp. 25-42. In Ginsberg H [ed. ], Ecology and environmental management of Lyme disease. Rutgers University Press, New Brunswick, NJ. Ginsberg HS, Ewing CP. 1989a. Comparison of flagging, walking, trapping, and collecting from hosts as sampling methods for northern deer ticks, Ixodes dammini, and lone-star ticks, Amblyomma americanum (Acari: Ixodidae). Experimental Applied Acarology 7: 313-332. Ginsberg HS, Ewing CP. 1989b. Habitat distribution of Ixodes dammini (Acari: Ixodidae) and Lyme disease spirochetes on Fire Island, New York. Journal of Medical Entomology 26: 183-189. Godsey MS Jr., Amundson TE, Burgess EC, Schell W, Davis JP, Kaslow R, Edlemann R. 1987. Lyme disease ecology in Wisconsin: Distribution and host preferences of Ixodes dammini, and prevalence of antibody to Borrelia burgdorferi in small mammals. American Journal of Tropical Medicine and Hygiene 37: 180-187. Logan TM, Wilson ML, Cornet JP 1993. Association of ticks (Acari: Ixodidae) with rodent burrows in northern Senegal. Journal of Medical Entomology 30: 799-801. Lastavica CC, Wilson ML, Berardi VP, Spielman A, Deblinger RD. 1989. Rapid emergence of a focal epidemic of Lyme disease in coastal Massachusetts. New England Journal of Medicine 320: 133-137. Magnarelli LA, Anderson JF, Apperson CS, Fish D, Johnson RC, Chappell WA. 1986. Spirochetes in ticks and antibodies to Borrelia burgdorferi in white-tailed deer from Connecticut, New York State, and North Carolina. Journal of Wildlife Disease 22: 178-188. Mather TN, Mather ME. 1990. Intrinsic competence of three ixodid ticks (Acari) as vectors of the Lyme disease spirochete. Journal of Medical Entomology. 27: 646-650. Mather TN, Duffy DC, Campbell SR. 1993. An unexpected result from burning vegetation to reduce lyme disease transmission risks. Journal of Medical Entomology 30: 642-645. Mather TN, Piesman J, Spielman A. 1987a. Absence of spirochetes (Borrelia burgdorferi) and piroplasm (Babesia microti) in deer ticks (Ixodes dammini) parasitized by chalcid wasps (Hunterellus hookeri). Medical and Veterinary Entomology 1: 3-8. Mather TN, Ribeiro JMC, Moore SI, Spielman A. 1988. Reducing transmission of Lyme disease spirochetes in a suburban setting. Annuals of the New York Academy of Science 539: 402-403. Mather TN, Ribeiro JMC, Spielman A. 1987b. Lyme disease and babesiosis: Acaricide focused on potentially infected ticks. American Journal of Tropical Medicine and Hygiene 36: 609-614. Matthewson M. 1984. The future of tick control: A review of the chemical and non-chemical options. Previews of Veterinary Medicine 2: 559-568. Miller GL, Craven RB, Bailey RE, Tsai TF. 1990. The epidemiology of Lyme disease in the United States, 1987-1988. Laboratory Medicine 21: 285-289. Olkowski W, Olkowski H, Daar S. 1990. Managing ticks the least toxic way. Common Sense Pest Control 6: 4-29. Piesman J, Donahue JG, Mather TN, Spielman A. 1986a. Transovarially acquired Lyme disease spirochetes (Borrelia burgdorferi) in field-collected larval Ixodes dammini (Acari: Ixodidae). Journal of Medical Entomology. 23: 219. Piesman J, Spielman A, Etkind P, Ruebush TK, Juranek DD. 1979. Role of deer in the epizootiology of Babesia microti in Massachusetts, USA. Journal of Medical Entomology 15: 537-540. Piesman J, Mather TN, Levine JG, Campbell JD, Karakashian SJ, Spielman A. 1986b. Comparative prevalence of Babesia microti and Borrelia burgdorferi in four populations of Ixodes dammini in eastern Massachusetts. Acta Tropica 43: 263-270. Randolph SE. 1979. Population regulation in ticks: the role of acquired resistance in natural and unnatural hosts. Parasitology 79: 141-156. Roberts D, Daoust R, Wraight S. 1983. Bibliography on pathogens of medically important arthropods. World Health Organization. Severinghaus CW, Brown CP. 1956. History of the white-tailed deer in New York. New York Fish & Game Journal 3: 129-167. Shulze TL, McDevitt WM, Parkin WE, Shisler JK. 1987. Effectiveness of two insecticides in controlling Ixodes dammini (Acari: Ixodidae) following an outbreak of Lyme disease in New Jersey. Journal of Medical Entomology 24: 420-424. Sonenshine DE, Haines G. 1985. A convenient method for controlling populations of the American dog tick, Dermacentor variabilis (Acari: Ixodidae), in the natural environment. Journal of Medical Entomology 22: 577-583. Spielman A, Wilson ML, Levine JE, Piesman J. 1985. Ecology of Ixodes dammini-borne human babesiosis and Lyme disease. Annual Review of Entomology 30: 439-460. Stafford KC III. 1989. Lyme disease prevention: personal protection and prospects for tick control. Connecticut Medicine 53: 347-351. Stafford KC III. 1991. Effectiveness of carbarl applications for the control of Ixodes dammini (Acari: Ixodidae). Journal of Medical Entomology 28: 611-617. Steere AC, Taylor E, Malawista SE, Snydman DR, Shope RE, Andiman WA, Ross MR, Steele FM. 1977. Lyme arthritis: an epidemic of oligoarticular arthritis in children and adults in three Connecticut communities. Arthritis Rheumatism. 20: 7-17. White DJ. 1993. Lyme disease surveillance and personal protection against ticks pp. 99-177. In Ginsberg H [ed. ], Ecology and environmental management of Lyme disease. Rutgers University Press, New Brunswick, NJ. Wilson ML. 1986. Reduced abundance of adult Ixodes dammini (Acari: Ixodidae) following the destruction of vegetation. Journal of Economic Entomology 79: 693-696. Wilson ML. 1994. Population ecology of tick vectors: interaction, measurement, and analysis. pp. 20-44. In Sonenshine DE, Mather TN [eds. ], Ecological dynamics of tick-borne zoonoses. Oxford University Press, New York, NY. Wilson ML, Adler GH, Spielman A. 1985. Correlation between abundance of deer and that of the deer tick, Ixodes dammini (Acari: Ixodidae). Annuals of the Entomology Society of America 78: 172-176. Wilson ML, Deblinger RD. 1993. Vector management to reduce the risk of Lyme disease pp. 126-156. In Ginsberg H [ed. ], Ecology and environmental management of Lyme disease. Rutgers University Press, New Brunswick, NJ. Wilson ML, Litwin TS, Gavin TA, Capkanis MC, Maclean DC, Spielman A. 1990. Host-dependent differences differences in feeding and reproduction of Ixodes dammini (Acari: Ixodidae). Journal of Medical Entomology 27: 945-954. Wilson ML, Spielman A. 1985. Seasonal activity of immature Ixodes dammini (Acari: Ixodidae). Journal of Medical Entomology 22:408-414. Wilson ML, Telford SR III, Piesman J, Spielman A. 1988. Reduced abundance of immature Ixodes dammini (Acari: Ixodidae) following elimination of deer. Journal of Medical Entomology 25: 224-228. Publication Date: July 2000. Latest revision: December 2014. Reviewed: December 2017.